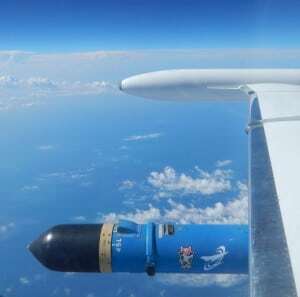 [Via Satellite 08-06-2014] Generation Orbit Launch Service successfully completed a captive-carry test flight for its Flight Bed Experiment (GO-FET) from Florida’s Cecil Spaceport. The three-hour test met all primary and secondary objectives using a Learjet 35 carrier aircraft with a standardized pod integrated to a wing hardpoint. The primary purpose of the test was to evaluate the handling qualities of the aircraft during a high altitude, high flight path angle launch maneuver. The Cecil Spaceport simulated a complete dry run of launch operations during the test. Generation Orbit carried several payloads during the test, including a 1U CubeSat for BlueCube Aerospace. Other payloads collected data on propellant management, payload integration and wireless communications. “The successful completion of this flight test is a great step forward toward viable air launch operations for both suborbital and orbital rockets. The lessons learned from this operation will help us refine our operational concept, as well as improve the design of our launch system,” said AJ Piplica, COO of Generation Orbit.